Most everyone knows a wild animal with her young, even a small bird, can be a fierce protector. 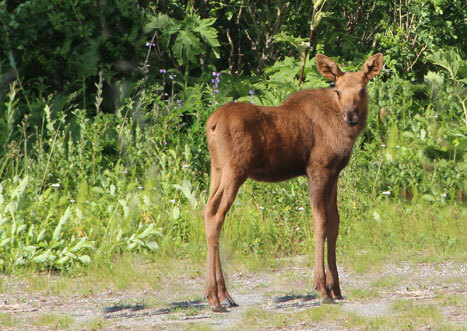 While driving along the Kenai Peninsula Highway toward our campground, I spied a little, brownish red moose calf standing on a dirt driveway. I stopped. The driveway was surrounded by tall brush, tall grass and plenty of deadwood lying about. A 4-foot high chain link property-boundary fence was set perpendicular to the highway, deep in fire weeds and tall grass. My mind was focused on the cow moose, she couldn’t be far off. Praying the fence dividing us would be enough barrier, I moved the truck slowly, positioning it just right, door open in case I needed to make a rapid exit. Stepping very quietly out of the truck, I approached the chain link fence with great caution. Oh my! Now there was a second calf! YIKES Twins! Where can the mama moose be? I started shooting. My camera quit. Beep, digital card full! Oh. Boy! Stress! I rushed to erase a few old images mindful that my attention needed to be on my surroundings and the unseen mother. To my amazement, the little calves were moving in my direction. Oh, dear, where can their mother be! They moved curiously but cautiously toward me. I clicked off a couple more images then, Rats! Card full again! Began erasing while simultaneously creeping low along the fence. Where is the mama? I stood up, lifted the camera eye piece toward my eye—there was a sound like munching. I stopped dead. Froze. My eyes scanned the nearby brush just over the fence. Wait a minute, something moved. What? A brown wall. Then munch, munch, m-m-m- munch… again. My eyes were struggling. What was that? Uh-oh! 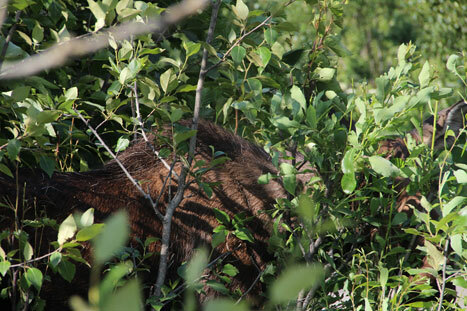 There, not eight feet from me, was the camouflaged mama moose, pulling up plants and munching. I was so close I missed her completely! Large as a barn door, coarse brown hair, her head as big as a Navy duffel bag, her ears at least 14 inches long. So huge and so close I couldn’t recognize her in her brush cover. Her shoulder was above my head. I had to look up just to see the line of her back. Slowly I backed away. That’s what they say, don’t they? Don’t run, Gulp! I needed a wider camera view and stepped ever so lightly backward, while erasing images and watching her. I stepped on a brittle branch and it broke…..crack…. Mama bolted and roared out of the bushes scaring the devil out of me. 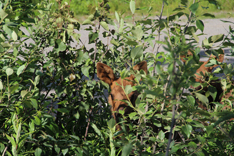 She “bull-moosed” to more brush cover maybe fifty feet off, the calves scrambling too! 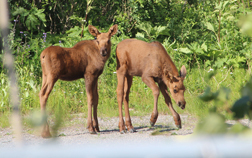 Moose have a peculiar ambling, John Wayne sort of gait. She stopped and stared back at me. The calves were circling around under the protection of her legs and some bushes. Camera full again!!! Arrrggghhh. Erased more images, very frustrated. At the end of the day I had enough successful images to be able to tell this amazing story. 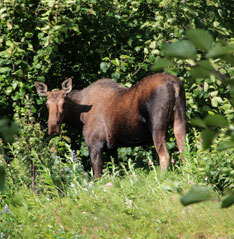 And here is Mama Moose staring back at me. I suppose the calves, are still staring, must see me as an oddity, a one-eyed animal in a Lakota Indian baseball cap! MORAL: Be sure to erase your image card after downloading your images!